Pope Gregory XVI established the first Diocese in the State of Indiana at Vincennes in 1834, and the entire state plus the eastern third of Illinois were under its jurisdiction. In 1857 the northern half of the state became the Diocese of Fort Wayne. After 1878 the bishop of Vincennes lived in Indianapolis and in 1898 the diocesan name was changed to Diocese of Indianapolis. Then in 1944, the Diocese of Indianapolis was elevated to an Archdiocese, and the two new Suffragan Sees were also erected, the Diocese of Evansville and the Diocese of Lafayette in Indiana. The Diocese of Evansville, having an area of 5,010 square miles and comprising twelve counties in the southwestern section of Indiana, was created by Pope Pius XII on November 11, 1944. The episcopal residence is in the city of Evansville. The present Diocese of Evansville has 45 parishes divided into 4 deaneries with a Catholic population of 79,500. 1674 -- Pope Clement X established the Diocese of Quebec, which included Indiana. 1702 -- Account of Mass celebrated along the lower Wabash River (presumed to be the Ohio River bordering present-day Illinois and Kentucky. 1732 -- Acquisition of property for St. Francis Xavier Church, Vincennes. 1749 -- Sacramental records began at St. Francis Xavier Church, Vincennes, the state's first parish. 1770 -- Father Pierre Gibault became pastor of Vincennes under the Diocese of Quebec. 1789 -- Vincennes and all of Indiana came under the jurisdiction of the Diocese of Baltimore. 1808 -- Indiana became part of the Diocese of Bardstown, Kentucky. 1814 -- Bishop Benedict Flaget of Bardstown administered Confirmation in Vincennes; first visit of a Catholic bishop to Indiana. 1816 -- Indiana became the nineteenth state. 1834 -- Father Simon Brute was named first Bishop of Vincennes which included entire state of Indiana and the eastern third of Illinois. St. Francis Xavier Church became the first cathedral of the Diocese of Vincennes. 1839 -- Bishop Brute died and was succeeded by Bishop Celestine de la Hailandiere. 1843 -- Illinois portion of diocese became part of the Diocese of Chicago. 1847 -- Bishop Hailandiere resigned and was succeeded by Bishop John Stephan Bazin. 1848 -- Bishop Bazin died and Rev. Jacques Maurice de St. Palais was appointed Apostolic Administrator. 1849 -- Jacques Maurice de St. Palais became the fourth Bishop of Vincennes. 1857 -- Northern portion of the diocese became the Diocese of Fort Wayne. 1877 -- Bishop St. Palais died and Father Auguste Bessonies became diocesan administrator. 1878 -- Francis Silas Chatard became the fifth Bishop of Vincennes but he resided in Indianapolis, largest city in his diocese. 1898 -- Indianapolis became See City of the diocese; the Diocese of Vincennes became the Diocese of Indianapolis on March 28. 1918 -- Bishop Chatard died and was succeeded by Bishop Joseph Chartrand. 1934 -- Bishop Joseph Ritter succeeded Bishop Chartrand who died on December 8, 1933.
and Assumption Church became the Cathedral Church for the diocese. The first Chancery was housed in the Reitz Home. 1948 -- First Synod of the Diocese of Evansville was held. 1957 -- Chancery moved to office space adjacent to Holy Trinity Church. 1958 -- Second Synod of the diocese was held. 1965 -- Assumption Cathedral property sold and church dismantled. Holy Trinity Church designated as Pro-Cathedral for the diocese. 1966 -- Paul F. Leibold installed as Second Bishop of Evansville. 1969 -- Third Synod of the diocese was held. was elevated to the rank of Minor Basilica. 1977 -- Ordination of the first class of Permanent Deacons in the diocese. 1989 -- Rev. Msgr. Gerald A. Gettelfinger of Indianapolis named Fourth Bishop of Evansville. 1993 -- Fourth Synod of the diocese was held. 1997 -- Auxiliary Bishop Gerald Wilkerson of Los Angeles named Titular Bishop of Vincennes. 1999 -- St. Benedict Church dedicated as the diocesan Cathedral on April 11. 2001 -- Center for Hispanic Ministry dedicated as the Guadalupe Center on December 9. 2002 -- Diocesan Review Board established to review allegations of abuse. 2005 -- Pope John Paul II dies and Pope Benedict XVI named new pope. 2006 -- Bishop Gerald Gettelfinger celebrates his 45th anniversary of priesthood. 2007 -- St. Francis Xavier (Old Cathedral) in Vincennes celebrates its 275th anniversary. 2008 -- St. Mary and St. Simon Parishes in Washington merge to become Our Lady of Hope Parish. 2009 -- Bishop Gettelfinger observes 20th anniversary as bishop of Evansville. 2011 -- Bishop Gettelfinger celebrates 22nd anniversary as bishop and 50th anniversary of priesthood. 2011 -- Bishop Charles Thompson ordained and installed as fifth bishop of Evansville. 2012 -- Bishop Charles Thompson celebrates 25th anniversary of priesthood. 2013 -- Pope Benedict XVI resigns and Pope Francis named new pope. 2014 -- Bishop Emeritus Gerald Gettelfinger celebrates 25th anniversary as a bishop. 2014 -- Nineteen parishes merge to form eight parishes as a result of a strategic planning process. 2015 -- Seven parishes merge to form three parishes as a result of the continuing strategic planning process. 2016 -- Thirteen parishes merge to form five parishes as a result of the continuing strategic planning process. 2017 -- Two parishes become one in the final merge of the strategic planning process. 2017 -- Bishop Thompson named Archbishop of Indianapolis. St. Francis Xavier Church occupies land that was granted to the Catholic church by the King of France. The first parish records date from 1749. The present building shown at left was begun by Rev. J.L. Champomier in 1826 and completed by Bishop de la Hailandiere in 1839. St. Francis Xavier Church became the first cathedral church in the state when Pope Gregory XVI established Vincennes as the first diocese in Indiana in 1834. The first four bishops of Vincennes (Brutè, de la Hailandière, Bazin, and De St. Palais) are buried in the crypt below the church. In 1898, the See City was moved to Indianapolis and the diocese became the Diocese of Indianapolis. The church was elevated to the level of Minor Basilica in 1970. Assumption Church was founded in Evansville in 1837 by Father Anthony Deydier. It was the first Catholic church in Evansville and the fourth parish established in present diocesan boundaries. 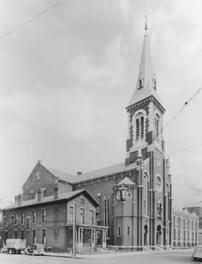 The first church was located at Second and Sycamore Streets. In 1871, that building was sold and a new church, shown at left, was built on Seventh Street. In 1944, Pope Pius XII created the Diocese of Evansville with the See City in Evansville. The first bishop, Henry J. Grimmelsman, dedicated Assumption Church as the Cathedral Church for the new diocese. In 1965 the property was sold to the city of Evansville for their new Civic Center Complex. 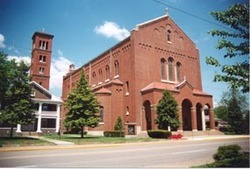 Holy Trinity Parish was established in 1849 by Father Francis Kutassy and was the second Catholic church in the city of Evansville. In 1950 lightning struck the church and it burned to the ground. The present building, shown at left, was completed in 1957. It served the diocese as the Pro-Cathedral from 1965, when Assumption was torn down, until 1999. Holy Trinity Parish merged with Sts. Mary & John Parish in 2015, and the church building was named an oratory. In 2017, the oratory was relegated to profane but not sordid use, and all remaining pastoral activities were transferred to St. Mary Church. St. Benedict Church was established in 1912 and the first church building was completed in 1914. The new parish was placed under the care of the Benedictine Monks from St. Meinrad by Bishop Chartrand. The present building, shown at left, was completed in 1928. Both Bishop Francis Shea and Bishop Gerald Gettelfinger were ordained and installed here. On April 11, 1999, Bishop Gettelfinger dedicated St. Benedict Church as the Cathedral Church of the Diocese of Evansville.